Got the upside breakout I was hoping for so I sat tight and waited for this quick pullback. 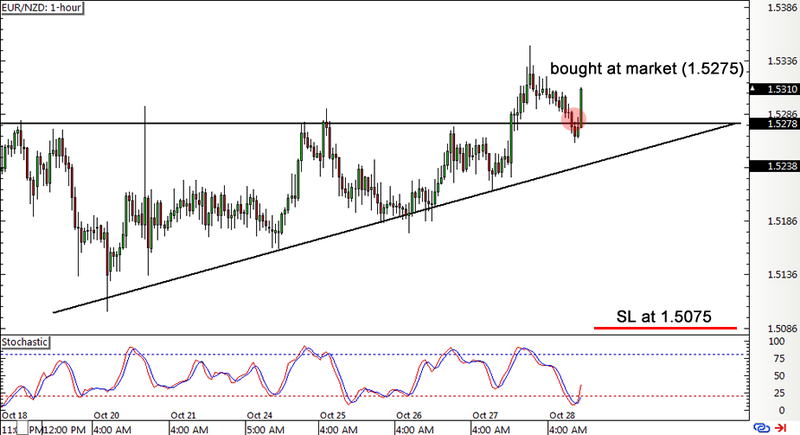 Here’s a quick update on my EUR/NZD idea. In my initial trade setup, I was watching the major support at the bottom of the daily range when I saw reversal candlesticks forming at that area. However, I wasn’t too convinced that the floor would hold then so I patiently waited for more confirmation. And that’s exactly what I saw when I zoomed in to the 1-hour chart of EUR/NZD recently, as price just busted past the ascending triangle resistance at 1.5300. Price retreated from this sharp climb and found support at the area of interest so I decided to go long at market. Stochastic is turning up from the oversold area to confirm that buying pressure is returning, with a bit of bullish divergence to boot. Economic data from the euro zone hasn’t been all that bad, as the euro selloff last week seems to have been spurred by disappointment that the ECB isn’t really thinking of tapering QE yet rather than actual data misses. In fact, PMI readings from Germany and France earlier this week came in mostly stronger than expected while business and consumer sentiment have also improved. Meanwhile, RBNZ rate cut expectations could continue to keep the Kiwi’s wings clipped for the time being, along with weak inflation-related indicators from New Zealand’s neighbor, Australia. Long EUR/NZD at market (1.5275), stop loss at 1.5075, profit target at 1.5725 for a potential 2.25-to-1 R:R. I’ve risked 0.5% of my account on this trade.